IRISS is a Coordination and Support Action that receives funding from the European Commission's 7th Framework Programme (FP7/2007-2013) under Grant Agreement No. 287842. It involves 16 contractual partners - all of which members of the European Technology Platform EPoSS - and a number of Associated Partners. It covers the whole value chain from researchers to end-users. The start date was October 1, 2011. The project duration is 24 months. Europe benefits from leadership across a breadth of industries including automotive, avionics, information and communication technologies, medical equipment and industrial automation. Incorporated Smart Systems, including smart components (and in the future Micro-Nano-Bio Systems) often provide the key technical features for the competitiveness of products in these sectors. the overcoming of fragmentation in the political landscape. to draw together a network to support the implementation of its recommendations. The work in IRISS is organized in 7 thematic work packages. Work Package 2 targets coordination and interaction of national and EU R&D programmes in the area of Smart Systems Integration (SSI). It is led by IKERLAN. 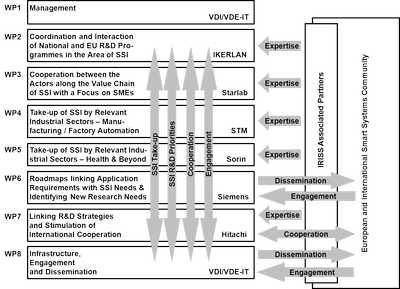 Work Package 3 on cooperation between the actors along the value chain of Smart Systems Integration with a focus on SMEs and including a study on value creation of Smart Systems in Europe is led by Starlab. Work Packages 4 and 5 aim at take-up of Smart Systems by relevant industrial sectors. WP4 focuses on manufacturing - both manufacturing of Smart Systems and the use of Smart Systems for manufacturing and is led by STM. WP5 is on Smart Systems in health and beyond with a special focus on Micro-Nano-Bio Systems. WP leader is Sorin. Work Package 6 under the leadership of Siemens covers roadmapping exercises linking application requirements with SSI needs and the identification of new research needs. Work Package 7 concentrates on stimulation of international cooperation and is led by Hitachi. The above work packages are further supported by Work Package 8 on infrastructure, engagement and dissemination. This work package, which is led by coordinator VDI/VDE-IT, has a strong focus on activities that target until now SSI unaware stakeholders and user communities. In addition to the 16 Contractual Partners, all of which are EPoSS members, IRISS involves a number of Associated Partners that support the project by providing input to the work packages and feedback on the work performed by the consortium.